Franz Kafka looms over the twentieth century more inappropriately than any other artist that I can imagine. High school and college students have to read Metamorphosis about poor Gregor Samsa and his very bad morning. For me, and I suspect many others, the personification of all the great works of literature that teachers inflicted on me in school was this man, F. Kafka. the professor commented that he had included The Trial as a nice break from the intensity of all the other readings. All of us must have looked at him as though he were mad. 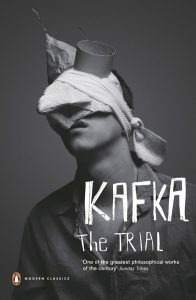 Then he said the simplest, most brilliant thing: “You do realize that Kafka meant it all as a joke. He thought he was being funny. All of it. Everything he wrote. If you don’t see the humor in it, then you probably ought to go back and read it again.” As we’ve established, I had to read it for the first time, but I went in looking for the humor. Let me tell you, there is nothing like being told you don’t have to respect your elders. The curtains parted. The Trial is truly pretty funny. Sure, it’s disturbing, but sometimes you just have to laugh. Kafka knew that. Dickens and Conrad knew that. All of them knew that. The best thing you can do when faced with that book that you never dared tackle is remember that it was written by a human being. All art captures the rainbow of emotions. It’s okay to laugh when you see a Jackson Pollack painting, or cry, for that matter. If Dylan and Mozart can be us jumping for joy and screaming with anger, then so can Franz Kafka. So, perhaps Kafka really tells us one of the better lessons of life in the twentieth century and beyond- it is all about maintaining your perspective. He wrote from his heart, but he also knew that they were merely words on paper. He asked that those left behind burn it all upon his death. Someone with a different point of view did not follow his wishes. I’m grateful, but it helps to know that this titan of world literature had no interest in posterity. You’ve Got to Check This Out is a blog series about music, words, and all sorts of artistic matters. It started with an explanation. 214 more to go.